Where do the excess nutrients (phosphorus and nitrogen) in the Assabet River come from? 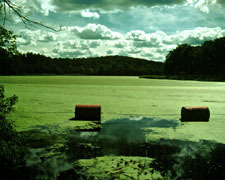 The Massachusetts Department of Environmental Protection's study of the Assabet's nutrient problems (nutrient Total Maximum Daily Load Study) showed that, during the critical summer months, 70-99% of the nutrients entering the Assabet come from the four municipal wastewater treatment plants that discharge treated effluent (sewage) to the river. In particular, treatment plants are the major source of ortho-phosphorus (the bioavailable form of phosphorus) throughout the year. Non-point sources (such as stormwater runoff) also contribute nutrients, but contribute significantly less, than the point sources over the growing season. The bulk of the phosphorus entering the river comes from the four municipal wastewater treatment plants that discharge to the river. The principal non-point source of phosphorus during the growing season is phosphorus flux from the sediments that have collected behind dams. The Assabet is "nutrient-saturated" and that significant decreases in the concentrations of nutrients in the river will be needed to improve water quality.